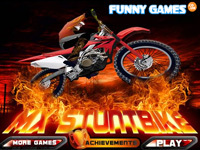 In this game, you are a stunt motor bike rider. Every time, you have to use the ramp to jump over all sorts of obstacles, like cars and burning tires. Show off some neat tricks for extra credit, as you are diverted to the upgrade screen every time you have enough points. Here, you can upgrade your motor by diminishing its weigh or increasing speed and power. Do not forget to brake in time! Enjoy!